Many tools that use cryptography on GNU/Linux and the internet revolve around the Pretty Good Privacy software standard (OpenPGP). The GNU Privacy Guard (GnuPG or GPG) is a popular free software implementation of this standard. Generation of keypairs, randomly-generated and mathematically linked pairs of files, one of which is kept permanently secret (the private key) and one of which is published (the public key). This is the basis of asymmetric key cryptography. Managing keys, both your own public and private key, along with other people’s public keys, so that you can verify others’ messages and files, or encrypt them so that only those people can read them. This might include publishing your public key to online keyservers, and getting people to sign it to confirm that the key is really yours. Signing files and messages with your private key to enable others to verify that a file or message was authored or sighted by you, and not edited in transmission over untrusted channels like the internet. The message itself remains readable to everybody. Encrypting files and messages with other people’s public keys, so that only those people can decrypt and read them with their private keys. You can also sign such messages with your own private key so that people can verify that it was sent by you. We’ll run through the fundamentals of each of these. We won’t concern ourselves too much with the mathematics or algorithms behind these operations; the Wikipedia article for asymmetric key cryptography explains this very well for those curious for further details. Let’s start by generating a 4096-bit RSA keypair, which should be more than sufficient for almost everyone at the time of writing. We’ll observe a few of the best practices recommended for the Debian developers. Doing this on a private, up-to-date desktop machine is best, as it’s easier to generate entropy this way. It’s still possible on an SSH-only headless server, but you may have to resort to less cryptographically sound methods to generate proper randomness. These lines tell GnuPG to use the cryptographically stronger SHA256 hashing algorithm for signatures in preference to the long-broken SHA1 algorithm. Next, we’re prompted for a passphrase to encrypt the key, so that if it ever falls into the wrong hands, nobody will be able to use it without knowing the passphrase. Choose a sequence of random words, or possibly a unique sentence you can easily memorise in any language, the longer the better. Don’t choose anything that might be feasibly guessable, like proverbs or movie quotes. You will also need to remember how you typed the passphrase exactly; I recommend using all-lowercase and no punctuation. Wikipedia has a few guidelines here. You’ll need to type the passphrase twice to confirm it, and it won’t echo on your terminal, much as if you were typing a password. This step is necessary for the computer to generate sufficient random information to ensure that the private key being generated could not feasibly be reproduced. Moving the mouse around and using the keyboard on a desktop system is ideal, but generating any kind of hardware activity (including spinning disks up) should do the trick. Running expensive find(1) operations over a filesystem (with contents that couldn’t be reasonably predicted or guessed) helps too. This step benefits from patience. You might find discussion online about forcing the use of the non-blocking PRNG random device /dev/urandom instead, using a tool like rngd(1). This definitely speeds up the process, but if you’re going to be using your key for anything serious, I recommend actually interacting with the computer and using hardware noise to seed the randomness adequately, if you can. The directory ~/.gnupg contains the managed keys. It’s very, very important to keep this directory private and to back it up securely, preferably to removable media that you keep in some physically secure place. Don’t lose it! In most contexts in GnuPG, you can refer to a key by the name of its owner, or by its eight-digit hex ID. I prefer the latter method. Here, the short ID of my main key is 040FE79B. While you shouldn’t use this for any actual verification, it’s sufficiently unique that you can use it to identify a specific key on your keyring with which you want to work. While you can export private keys the same way with --export-secret-key, you should never, ever provide anyone with your private key, so this shouldn’t be necessary. You should store the resulting revoke.asc file somewhere safe. You can use this certificate to revoke your key later on if the private key is ever compromised, so that people know the key should no longer be used or trusted. You may even like to print it out and keep a hard copy, as the output of gpg suggests. With the above setup done, we can proceed with some basic usage of GnuPG, as discussed in the next article. In the output of both commands, you’ll note we actually have two private and two public keys. The sub line refers to the encryption subkey automatically generated for you. The master key is used for cryptographic signing, and the subkey for encryption; this is how GnuPG does things by default with RSA keypairs. For extra security, it might be appropriate to physically remove the master private key from your computer, and instead use a second generated subkey for signing files as well. This is desirable because it allows you to keep the master key secure on some removable media (preferably with a backup), and not loaded on your main computer in case you get compromised. This means you can sign and encrypt files as normal with your signing subkey and encryption subkey. If those keys ever get compromised, you can simply revoke them and generate new ones with your uncompromised master key; everyone who has signed your public master key or otherwise indicated they trust it will not have to do that all over again. For details on how to do this, I suggest reading the Debian Wiki article on subkey management. However, it’s not necessary for performing basic GPG operations. Thanks to commenter coldtobi for recommending setting a key expiry. This entry is part 2 of 10 in the series GNU/Linux Crypto. Now that we have both GnuPG and SSH securely set up, we’re able to encrypt, decrypt, sign, and verify messages, and securely authenticate to remote servers without any risk of exposing passwords and with effectively zero possibility of a brute-force attack. This is all great, but there’s still one more weak link in the chain with which to deal — our passphrases. If you use these tools often, typing your passphrase for most operations can get annoying. It may be tempting to either include a means of automating the passphrase entry, or not to use a passphrase at all, leaving your private key unencrypted. As security-conscious users, we definitely want to avoid the latter in case our private key file ever gets stolen, which is where the concepts of agents for both SSH and GnuPG comes into play. An agent is a daemon designed to streamline the process of using decrypted private keys by storing the details securely in memory, ideally for a limited period of time. What this allows you do with both SSH and GnuPG is to type your passphrase just once, and subsequent uses that require the unencrypted private key are managed by the agent. In this article, we’ll go through the basics of agent setup for both SSH and GnuPG. Once we know how they work, we’ll then introduce a convenient tool to start both of them and manage them for us easily. The ssh-agent(1) program comes as part of the OpenSSH suite. It can be run in two modes, either as a parent process, or daemonized into the background. We’ll discuss the latter method, as it’s more commonly used and more flexible. So if it’s running fine, what’s with all the shell script it outputs? Why doesn’t it just run that for us? The answer is an interesting workaround to a stricture of the Unix process model; specifically, a process cannot modify its parent environment. The variables SSH_AUTH_SOCK and SSH_AGENT_PID are designed to allow programs like ssh(1) to find the agent so it can communicate with it, so we definitely need them set. However, if ssh-agent(1) were to set these variables itself, it would only apply for its own process, not the shell where we called it. With this done, the agent is ready, and we can start using it to manage our keys for us. Either way, you should be prompted for your passphrase; this is expected, and you should go ahead and type it in. Welcome to remote.sanctum.geek.nz, running GNU/Linux! You may like to consider adding this to ~/.bash_logout or a similar script to get rid of the running agent after you’re done with your session. This program may need to be installed separately. Under Debian-derived systems, its package name is ssh-askpass. We thus have to type our passphrase only once per login session, and can connect to all of the servers to which our keys confer access … very convenient! Finally, to prod gpg(1) into actually using the agent, we need to add a line to ~/.gnupg/gpg.conf. You can create this file if it doesn’t exist. The agent will be started, and all of its environment variables will be set and inherited by all subshells, just as with ssh-agent. If you’re using the console PIN entry tool, you should also add this to end of your interactive shell startup script. This should be ~/.bashrc for Bash on Linux; you may need to put it in ~/.bashrc on Mac OS X. To manage both ssh-agent(1) and gpg-agent(1) effectively, a tool called keychain(1) is available. It provides a simple way to start both agents with one command, including loading keys at startup, and also prevents running either agent twice, picking up on agents started elsewhere on the system. Because desktop environments are often configured to start one or both agents for users, it makes sense to re-use them where possible, at which keychain(1) excels. eval "$(keychain --eval id_rsa 0x77BB8872)"
If this program is available to you, then I highly recommend this; managing agents and environments can be fiddly, and keychain(1) does all the hard work for you in this regard so you don’t have to worry about whether an agent is available to you in your particular context. Check out the project’s homepage for more information about the tool. This entry is part 5 of 10 in the series GNU/Linux Crypto. It’s now becoming more widely known that using guessable passwords or using the same password for more than one account is a serious security risk, because an attacker able to control one account (such as an email account) can do a lot of damage. If an attacker gets the hash of your password from some web service, you want to be assured that the hash will be very difficult to reverse, and even if it can be reversed, that it’s unique and won’t give them access to any of your other accounts. Interestingly, because we now have a tidy GnuPG setup to handle the encryption ourselves, another option is the pass(1) tool, billing itself as “the standard UNIX password manager”. It’s little more than a shell script and some bash(1) completions wrapped around existing tools like git(1), gpg2(1), pwgen(1), tree(1), and xclip(1), and your choice of $EDITOR. If you’re not already invested in an existing password management method, you might find this a good first application of your new cryptography setup, and a great minimal approach to secure password storage accessible from the command line (and therefore SSH). Instructions for installing on other operating systems are also available on the site. Releases are also available for download, and a link to the development repository. If you use this, make sure you have the required tools outlined above installed as well, although xclip(1) is only needed if you run the X Windows system. To start, we’ll initialize our password store. For your own passwords, you will want to do this as your own user rather than root. Because pass(1) uses GnuPG for its encryption, we also need to tell it the ID of the appropriate key to use. Remember, you can find this eight-digit hex code by typing gpg --list-secret-keys. A unique string identifying your private key such as your name or email address may also work. Password store initialized for 0x77BB8872. pass(1) uses pwgen(1) for this password generation. In each case, the password is automatically inserted into the password store for you. If you do this, you may like to be careful that your editor is not configured to keep backups or swap files in plain text of documents it edits in temporary directories or memory filesystems. If you’re using Vim, I wrote a plugin in an attempt to solve this problem. Note that adding or overwriting passwords does not require your passphrase; only retrieval and editing does, consistent with how GnuPG normally works. Copied google.com/gmail/example@gmail.com to clipboard. Will clear in 45 seconds. In each case, note that if you have the bash completion installed and working, you should be able to complete the full path to the passwords with Tab, just as if you were directly browsing a directory hierarchy. [master (root-commit) 0ebb933] Added current contents of password store. [master 00971b6] Added given password for google.com/gmail/newexample@gmail.com to store. This entry is part 6 of 10 in the series GNU/Linux Crypto. An encrypted password storage is well and good, but now that we have a working GnuPG setup, we should consider using PGP for what it was originally designed: email messages. To do this, we’ll be using Mutt. Mutt is a console-based mail user agent, or MUA, designed chiefly for managing and reading mail. Unlike mailer programs like Thunderbird, it was not designed to be a POP3/IMAP client, or an SMTP agent, although versions in recent years do include this functionality; these are tasks done by programs like Getmail and MSMTP. If like many people, you’re using Gmail, this works very well with POP3/IMAP and SMTP, enabling you to compose email messages in plain text with your choice editor in a terminal window, in a highly configurable environment, and doing your own email encryption for any sensitive communications in such a way that even your email provider can’t read it. General usage of Mutt and setup for Gmail users is not covered in detail here, although it may be the subject of a later article. For now, there are many excellent articles on the basics of a Mutt setup. If you’re interested in the setup for other GNU/Linux mail clients like Claws or Thunderbird, Cory Sadowski has a very good article walking you through that, among other privacy settings relevant to both GNU/Linux and Windows. All of the below is assuming you already have a GnuPG keypair ready, with gpg-agent(1) running in the background to manage your keys. I’m all for the Unix philosophy of using programs together, but this is just too much. It’s a fickle setup that’s very hard to work with, and it requires too much understanding of the gpg(1) frontend to use and edit sensibly. After all, we want to end up with a setup that we understand reasonably well. Restart Mutt, and you should be ready to go. Remember, it’s your responsibility to decide how much you trust this public key; normally it’s best practice that you actually meet someone in person to exchange written key fingerprints in order to be completely sure that the key corresponds to that user. 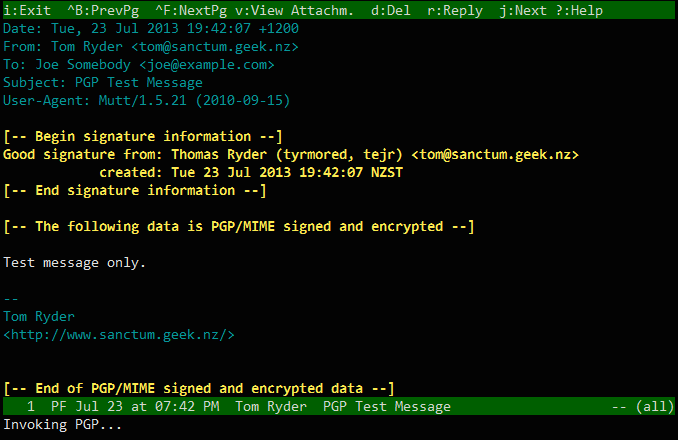 If you don’t have anyone else you know using PGP to communicate with, you can send me a message encrypted with my public key 0xC14286EA77BB8872 to tom@sanctum.geek.nz. If you send or link me your public key in your message, then I’ll reply to you with a message encrypted with your public key so you can check everything’s working. EDIT 2017: Yes, this offer is still good; you can still email me if you want to test your new setup; I will still reply to you! We’ll press b to both sign and encrypt the message. When you send the message with y, you might need to specify which key you want to use for each recipient, if you don’t have a unique key on your keychain with your recipient’s email address. Your recipient will be able to decrypt the message in their mail user agent with their private key, and nobody else but the two of you will be able to read it. Note that this works for any number of recipients, as long as you have a public key for each of them. Keep in mind that the metadata of the message, such as the sender and recipient name and address, date and time it was sent, and (importantly) the subject, are sent in plain text. Only the body of the message (including attachments) is encrypted. The first batch of options we set earlier will already automatically sign and/or encrypt messages in responses to messages doing either/both. All of this combines with Mutt’s extensive speed and high-powered configuration to make Mutt a very capable and convenient PGP mail client. As always, the more people you know using PGP, and the more public keys you have, the more useful this will be. This entry is part 7 of 10 in the series GNU/Linux Crypto. While having local backups for quick restores is important, such as on a USB disk or spare hard drive, it’s equally important to have a backup offsite from which you can restore your important documents if, for example, your office was burgled or burned down, losing both your workstation and backup media. The easiest way to do this for most people is with a storage provider, offering convenient access to bulk storage of suitable size maintained on another company’s systems for a relatively modest price or even for free, such as the Ubuntu One service, or Microsoft’s offering, Skydrive. The best storage providers will also encrypt the data on their own servers, whether or not they have access. The problem with encrypting whole files before we put them up for storage is that for even modestly sized data, performing entire backups and uploading all of the files together every time can cost a lot of bandwidth. Similarly, we’d like to be able to restore our personal files as they were on a specific date, in case of bad backups or accidental deletion, but without storing every file on every backup day, which may end up requiring far too much space. Normally, the solution is to use an incremental backup system, meaning after first uploading your files in their entirety to the backup system, successive backups upload only the changes, storing them in a retrievable and space-efficient format. Systems like Dirvish, a free Perl frontend to rsync(1), allow this. Unfortunately, Dirvish doesn’t encrypt the files or changesets it stores. What’s needed is an incremental backup solution that efficiently calculates and stores changes in files on a remote server, and also encrypts them. Duplicity, a Python tool built around librsync, excels at this, and can use our GnuPG asymmetric key setup for the file encryption. It’s available in Debian-derived systems in the duplicity package. Note that, as before, a GnuPG key setup with an agent is required for this to work. It’s important to specify --encrypt-key, because otherwise duplicity(1) will use symmetric encryption with a passphrase rather than a public key, which is considerably less secure. Specify the email address corresponding to the public keypair you would like to use for the encryption. You’ll note you were not prompted for your passphrase to do this. Remember, encrypting files with your public key does not require a passphrase; the whole idea is that anyone can encrypt using your key without needing your permission. The vol1.difftar.gpg file contains the actual data stored; the other two files contain metadata about the backup’s contents, for use to calculate differences the next time the backup runs. Note that the new files have the prefix duplicity-inc- or duplicity-new-, denoting them as incremental backups and not full ones. Note that in order to keep track of what files have already been backed up, duplicity(1) stores metadata in ~/.cache/duplicity, as well as storing them along with the backup. This allows us to let our backup processes run unattended, rather than having to put in our passphrase to read the metadata on the remote server before performing an incremental backup. Of course, if we lose our cached files, that’s OK; we can read the ones out of the backup vault by supplying our passphrase on request for decryption. Your backups will then be sent over an SSH link to the directory docsbackup on the system backup.example.com, with username user. In this way, not only is all the data protected in transmission, it’s stored encrypted on the remote server; it never sees your plaintext data. All anyone with access to your backups can see is their approximate size, the dates they were made, and (if you publish your public key) the user ID on the GnuPG key used to encrypt them. If you’re using the ssh-agent(1) program to store your decrypted private keys, you won’t even have to enter a passphrase for that. The duplicity(1) frontend supports other methods of uploading to different servers, too, including the boto backend for S3 Amazon Web Services, the gdocs backend for Google Docs, and httplib2 or oauthlib for Ubuntu One. If you like, you can also sign your backups to make sure they haven’t been tampered with at the time of restoration, by changing --encrypt-key to --encrypt-sign-key. Note that this will require your passphrase. Copying duplicity-full-signatures.20130727T053433Z.sigtar.gpg to local cache. Copying duplicity-full.20130727T053433Z.manifest.gpg to local cache. Copying duplicity-inc.20130727T053433Z.to.20130727T053636Z.manifest.gpg to local cache. Copying duplicity-new-signatures.20130727T053433Z.to.20130727T053636Z.sigtar.gpg to local cache. Note that this time you are asked for your passphrase. This is because restoring the backup requires decrypting the data and possibly the signatures in the backup vault. After doing this, the complete set of documents from the time of your most recent incremental backup will be available in docsrestore. /usr/bin/duplicity --encrypt-key "$keyid" -- "$local" "$remote"
The line with keychain is optional, but will be necessary if you’re using an SSH key with a passphrase on it; you’ll also need to have authenticated with ssh-agent at least once. See the earlier article on SSH/GPG agents for details on this setup. Run backups to your local servers too; this might prevent your backup provider from reading your files, but it won’t save them from being accidentally deleted. Verify complete: 2195 files compared, 0 differences found. This incremental system means that you’ll likely only have to make full backups once, so you should back up too much data rather than too little; if you can spare the bandwidth and have the space, backing up your entire computer isn’t really that extreme. Try not to depend too much on your remote backups; see them as a last resort, and work securely and with local backups as much as you can. Certainly, never rely on backups as a version control system; use Git for that. This entry is part 8 of 10 in the series GNU/Linux Crypto. GnuPG provides us with a means to securely encrypt individual files on a filesystem, but for really high-security information or environments, it may be appropriate to encrypt an entire disk, to mitigate problems such as caching sensitive files in plaintext. The GNU/Linux kernel includes its own disk encryption solution in the kernel, dm-crypt. This can be leveraged with a low-end tool called cryptsetup, or more easily with LUKS, the Linux Unified Key Setup, implementing strong cryptography with passphrases or keyfiles. In this example, we’ll demonstrate how this can work to encrypt a USB drive, which is a good method for securely storing really sensitive data such as PGP master keys that’s only needed occasionally, rather than leaving it always mounted on a networked device. Be aware that this erases any existing files on the drive. You can then follow the rest of this guide using /dev/loop0 as the raw block device in place of /dev/sdc1. In the above output, losetup -f returns the first available loop device for use. Setting up a LUKS container on the block device is then done as follows, providing a passphrase of decent strength; as always, the longer the better. Ideally, you should not use the same passphrase as your GnuPG or SSH keys. This creates an abstracted encryption container on the disk, which can be opened by providing the appropriate passphrase. A virtual mapped device is then provided that encrypts all data written to it transparently, with the encrypted data written to the disk. The last argument here is the filename for the block device to appear under /dev/mapper; this example provides /dev/mapper/secret. We can get some information about the LUKS container and the specifics of its encryption using luksDump on the underlying block device. This shows us the encryption method used, in this case aes-xts-plain64. If the data is a removable device, you should also consider physically removing the media from the machine and placing it in some secure location. This post only scratches the surface of LUKS functionality; many more things are possible with the system, including automatic mounting of encrypted filesystems and the use of stored keyfiles instead of typed passphrases. The FAQ for cryptsetup contains a great deal of information, including some treatment of data recovery, and the Arch Wiki has an exhaustive page on various ways of using LUKS securely. This entry is part 9 of 10 in the series GNU/Linux Crypto. While this series was being written, from June 2013, Edward Snowden began leaking top-secret documents from the United States National Security Agency, showing that the agency was capable of Internet surveillance on a massive scale with the PRISM surveillance system and with the XKeyscore interface into their amassed data. The fact that covert government surveillance was possible and was taking place does not come as particularly surprising news to network engineers and conspiracy theorists, but the revelations have finally given the general, non-technical public an idea of how badly the proprietary systems around which they have built much of their digital lives can be used to harm them and compromise their privacy. Concerned people in the United States will be only too aware of how the secret abuse of power to exercise this surveillance and the failed motions to curtail it by the United States Congress has dented their trust in their own government. However, the leaks’ implications are international as well. The foreign intelligence agency in my own country of New Zealand, the Government Communications Security Bureau, was earlier this year accused of illegally spying on New Zealand citizens, and diplomatic cables from WikiLeaks show the GCSB is potentially already cooperating with the NSA. In spite of this, new legislation is set to extend the GCSB’s powers, despite independent reviews condemning the bill from both a legal and human rights perspective, even after amendments. The scandal and the anger over surveillance abuse extends to the United Kingdom, Germany, Sweden, and many other countries. I do hold out some hope for the efforts such as the Electronic Frontier Foundation’s class action suit to curtail the surveillance or at the very least to register the public’s anger about this unwarranted intrusion into private lives. However I am concerned not just by the possibility of the rise of a global surveillance state, but by the implications this has for the right to secure communications using cryptography for authentication and encryption. It’s no secret that cryptography and encryption presents a problem to the NSA’s surveillance systems, and that they expend a great deal of effort in attempting to circumvent it, including demanding private keys from businesses for applications like HTTPS. My concern is this: If it becomes publically accepted that governments spy warrantlessly on international networks and that this is justified or necessary, then we may reach a point where the legality of the general public’s use of cryptography itself may again be called into question. Computing professionals of my generation likely did not begin their careers until after the United States’ cryptographic export controls were relaxed in 1999, perhaps prompting us to take for granted the availability of algorithms like RSA and AES with high key sizes for cryptographic purposes. A world where a government agency would actively attempt to curtail the use of such technology may seem very far-fetched to us — perhaps less so to those who remember that Pretty Good Privacy was a radical new idea that caused its activist creator Phil Zimmermann real legal trouble. I believe that computing enthusiasts and users of free software operating systems, not just cryptographic experts, are in a special position to assist their concerned friends and family with defending their online privacy and securing their communications, and that if we value both freedom and security of information, then we in fact have a responsibility to do so. I believe that people need to be aware of not just the implications of massive surveillance on a global scale, but also how to exercise their rights to fight against it. If the legality of cryptography is ever called into question again as the result of its impeding warrantless surveillance, then its pervasiveness and the public’s insistence on its free availability should make restricting its use not just impractical, but unthinkable. This entry is part 10 of 10 in the series GNU/Linux Crypto.